Combining historical analysis with contemporary observation, Susan Jacoby dissects a new American cultural phenomenon--one that is at odds with our heritage of Enlightenment reason and with modern, secular knowledge and science. With mordant wit, she surveys an anti-rationalist landscape extending from pop culture to a pseudo-intellectual universe of "junk thought." Disdain for logic and evidence defines a pervasive malaise fostered by the mass media, triumphalist religious fundamentalism, mediocre public education, a dearth of fair-minded public intellectuals on the right and the left, and, above all, a lazy and credulous public. Jacoby offers an unsparing indictment of the American addiction to infotainment--from television to the Web--and cites this toxic dependency as the major element distinguishing our current age of unreason from earlier outbreaks of American anti-intellectualism and anti-rationalism. With reading on the decline and scientific and historical illiteracy on the rise, an increasingly ignorant public square is dominated by debased media-driven language and received opinion. At this critical political juncture, nothing could be more important than recognizing the "overarching crisis of memory and knowledge" described in this impassioned, tough-minded book, which challenges Americans to face the painful truth about what the flights from reason has cost us as individuals and as a nation. 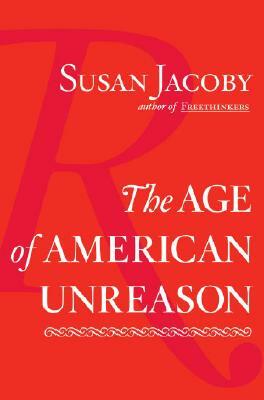 Susan Jacoby is the author of seven previous books, most recently "Freethinkers: A History of American Secularism, "which was named a Notable Book of 2004 by "The Washington Post Book World "and "The Times Literary Supplement." She lives in New York City. "The Age of American Unreason picks up where Richard Hofstadter left off. With analytic verve and deep historical knowledge, Susan Jacoby documents the dumbing down of our culture like a maestro. make no mistake about it, this is an important book." "This is one of the most eye-opening books I've read in a long time. Jacoby charts the intellectual and cultural currents that have characterized the United States since its founding and explains just how and why Americans have recently become so, well, dumb. Anyone who cares about the future of our country will want to read it." "Jacoby has written a brilliant, sad story of the anti-intellectualism and lack of reasonable thought that has put this country in one of the sorriest states in its history." "Jacoby's fearless jeremiad, at once passionate, witty, and solidly grounded in facts, aries at a propitious moment, when many Americans are perceiving that ignorance conjoined to arrogance can be deadly. This book deserves to be widely read, and especially by concerned parents. As Jacoby insists, it is only within families that some immunity to mind-numbing 'infotainment' can now be acquired. First, however, there must be a will to resist--and if this stirring book can't rally it, nothing can." "To a country of underachievers and proud of it, this book delivers a magnificent, occasionally hilarious kick in the pants. Snap out of it, Jacoby says: Getting it right matters. Tough talk and wicked wit in the tradition of Richard Hofstadter's Anti-Intellectualism in American Life and Neil Postman's Amusing Ourselves to Death."